Co-authored by Jake Ramsamugh, a researcher at the Henry Jackson Society, working in the Asia Studies Centre. President Trump knew exactly what he was doing when he announced news of a US military strike on Syria to a stunned Xi Jinping on the final evening of the US-China Summit at Mar-e-Lago last weekend. Trump significantly raised the stakes for China on North Korea, and along with the news that the USS Carl Vinson carrier strike group (CSG) had been rerouted from a planned trip to Australia to the Korean Peninsula, it told Beijing that the Administration means business. It is already apparent that Trump’s North Korea approach is different from any of his predecessors. For one thing, he has eschewed the delicate issue of Chinese support for the rogue regime and essentially asserted that a Chinese problem demands a Chinese solution. Echoing Hwang Jang Yop, one of the most senior defectors from North Korea, Jim Schoff, senior fellow at the Carnegie Endowment for International Peace states, 'Trump needs a lot of help from China to make it (a deal) even potentially viable'. By ordering the Carl Vinson to the Korean Peninsula in the wake of the Syria strikes, Trump puts his strongest card on the table: the possibility of unilateral military action, a nightmare scenario for China. With wide-ranging capacity to deliver deadly strikes with cruise missiles and air-to-ground munitions, the Carl Vinson and her strike group give Trump leverage that no other American president has applied to the Korean Peninsula. And while a conflict on the Peninsula is a horror scenario, it’s not clear that doing nothing is better. Sitting tight will eventually put the American heartland within range of North Korean nuclear missiles, raising the prospect that Pyongyang will see US nuclear deterrence as checked. This could in turn lead to North Korean adventurism against the South. Moving the USS Carl Vinson is designed to intensify pressure on China to break out of the current impasse. The fundamental question is how Beijing will react to Trump’s gambit. Will China use its considerable means to stop the North Korea nuclear program – as once the US did with its allies in South Korea and Taiwan – or will it continue to insist that North Korea is somebody else’s problem? Repeating a well-worn formula, the Chinese Ministry of Foreign Affairs has called for caution, with spokesman Hua Chunying asking all parties to 'exercise restraint and avoid activities that may escalate tensions'. Such phrases, trotted out after every North Korean provocation or missile test, have been shorn of meaning and indicate China is still playing on the idea that North Korea is someone else’s problem. China has long held that it is unable to put sufficient pressure on Pyongyang because it is fearful that a strong international response towards North Korea’s nuclear program could trigger the regime’s collapse. But while a collapse of North Korea would be a disaster for the Chinese, it is unclear that full sanctions and a unified approach wouldn’t push North Korean leaders to back down long before a collapse occurred. By holding up the worst-case scenario as the only scenario, China avoids having to deal more stringently with its ally. Yet when the US pressured Seoul to give up its nuclear program in 1975, South Korea did not immediately collapse like a house of cards. So the idea that Kim Jong-un would persist with nuclear weapons in the face of a unified sanctions regime by every major power in Asia is uncertain, to say the least. And Beijing could sweeten the deal by offering Pyongyang an alternative, like the nuclear umbrella that the US offers its allies. Perhaps Trump’s instinctive approach toward policy will pay dividends. On Monday, a top Chinese envoy on North Korea, Wu Dawei, met with his South Korean counterpart, Kim Hong-kyun, agreeing that both countries would take stronger action if North Korea tested more nuclear weapons and intercontinental missiles. Given China’s tendency for vacuous statements, this is a step in the right direction. President Xi urged Trump to pursue a 'peaceful resolution to the tensions' during a phone call the two leaders made on Wednesday. Such rhetoric can only be due to China taking Trump’s moves on North Korea seriously, at least in part. Trump after all tweeted less than a fortnight ago that he was prepared to act unilaterally against North Korea if it does not come to heel. Whatever China’s doubts, the missile strike against Assad displayed in dramatic fashion that Trump is willing to intervene suddenly in situations that others believe to be frozen and immune to intervention. Trump may have little time to act. The coming election in South Korea is widely predicted to bring to power a government soft on North Korea. Moon Jae-in, the likely election winner, has said no military action can be conducted without South Korean consent and that 'South Korea should be the owner of North Korean issues'. This is meant to signal that Moon does not want either the US or China to take control of the North Korean problem, an understandable position given Seoul’s fate if military conflict does take place. Trump’s policy pushes the ball into Beijing’s court, not Seoul’s, and this will rankle with the left-of-centre Moon. North Korea has reacted with predicable outrage both to America's Syria strike and the deployment of the carrier group. It has called the attack on Assad 'absolutely unpardonable' and claims it is ready for war with the US if provoked. 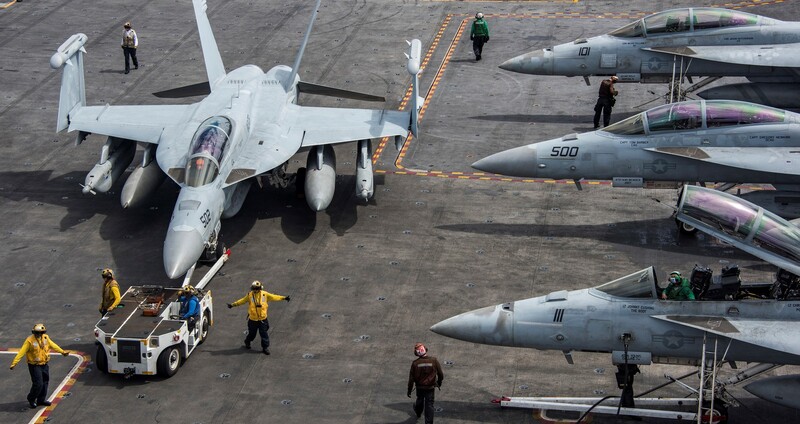 A spokesman from the DPRK Ministry of Foreign Affairs said the 'sudden' dispatch of the carrier task group to the peninsula is evidence that Washington’s 'reckless moves of invading the DPRK have reached a serious phase of its scenario'. There is no doubt that the presence of the carrier group will make North Korea feel extremely vulnerable in coming days. The danger is, of course, that it acts pre-emptively, as befitting a military and negotiating culture that has been honed under immense pressure. All eyes are on Beijing, and the coming weeks will be critical to the course of the Korean confrontation. This month, North Korea marks several major anniversaries, the most important of which, the 'Day of the Sun' on 15 April, is the birthday of the state’s founder Kim Il-Sung. Significant anniversaries are usually celebrated with demonstrations of military might and weapons tests. As the carrier group moves closer to North Korea, one wonders how this day will be commemorated in the last Stalinist state. Photo by Flickr user US Pacific Fleet. Kori Schake’s sober and clear-eyed analysis punctures both the realist sceptics and the liberal triumphalists. Yesterday afternoon Euan Graham spoke with prominent Japanese Sinologist Seiichiro Takagi.